(NaturalNews) Residues of the toxic herbicide glyphosate can be found on many popular breakfast foods, some of them in levels higher than maximums set by the Environmental Protection Agency (EPA), according to an analysis conducted by the Alliance for Natural Health USA (ANH-USA). 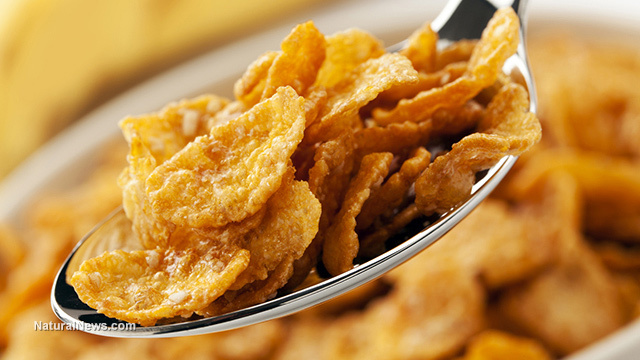 The foods found to be tainted included breakfast cereals, eggs and bagels. Additionally, the researchers discovered evidence that glyphosate can accumulate in the human body. Glyphosate is the active ingredient in Monsanto's Roundup, the top selling herbicide in the world. Roundup was first introduced in 1974, but its use did not explode until the introduction of the first Roundup-resistant genetically modified (GM) crops in the 1990s. When it was introduced, glyphosate was touted as biodegradable and harmless to humans and the environment alike. Accepting this claim, neither the FDA Pesticide Residue Monitoring Program and the USDA Pesticide Data Program ever bothered to collect information on glyphosate or its presence in food products. Numerous studies have in fact demonstrated dangerous effects from low-level glyphosate exposure, including hormonal disruption, organ damage and birth defects. But regulators largely ignored these risks — until in 2015, the International Agency for Research on Cancer (IARC) classified glyphosate as a probable carcinogen. Following the IARC's warning, the FDA announced it would begin testing for glyphosate residue on corn and soybeans — nearly all of which, in the United States, are GM. Yet according to ANH-USA, this will overlook many foods likely exposed to large amounts of Roundup. So the group contracted an independent, accredited lab to test both conventional and organic versions of 12 different breakfast foods: corn flakes, instant oatmeal, cream of wheat, flour, bread, bagels, potatoes, frozen hash browns, eggs, yogurt, and both dairy and non-dairy creamers. Of the 24 samples, 10 came back with detectable glyphosate residue. From most residue to least, these were: instant oatmeal, whole wheat bagels, whole wheat bread, cream of wheat cereal, organic eggs, organic bagels, organic whole wheat bread, organic dairy creamer, large eggs and organic soy creamer. Half of these contained levels above the EPA's Allowable Daily Intake (ADI) of 1.75 mg per kg of bodyweight. Even among these, there was wide variation: Organic eggs contained 179 parts per billion (ppb) of residue; bagels and bread contained 400–500 ppb; and instant oatmeal contained more than 1,300 ppb. However, any detectable residue is likely problematic, as the EPA's ADI has been criticized as too high for a number of reasons. The level is based on industry tests using high levels of pure glyphosate on laboratory animals, and therefore does not take into account the potential for chronic or long-term health effects from lower doses. This is a particular gap since endocrine-disrupting activity, which glyphosate demonstrates, often occurs at concentrations close to 1 ppb. Industry tests also fail to account for potential effects caused or exacerbated by the additives ("adjuvants") added to glyphosate to make up the final product, Roundup. Finally, the concept of an ADI fails to take into account that widespread contamination of food and water with Roundup makes it likely that exposure will exceed safe levels even if none of the foods people consume exceed the EPA's threshold. Notably, the EPA's ADI is nearly six times higher than that set by the European Union. ANH-USA drew attention to two disturbing implications of its findings. First of all, the highest levels of glyphosate residue were found on foods that come from wheat and oats, which are not Roundup-resistant. This means that non-GM crops are also widely contaminated, likely through the practice of using Roundup as a desiccant to ensure a synchronized harvest. Second, the presence of residue in eggs and dairy creamer suggests that glyphosate is accumulating in the bodies of animals that eat tainted crops. That means glyphosate is likely to accumulate in human bodies, as well. The presence of high residue levels on organic grains is also cause for concern. To learn more about contaminants in your food and what you can do to avoid them, check out Food Forensics, the new book by Mike Adams, director of CWC Labs and editor of Natural News. The book comes out July 26, but you can get a free sneak peek at the first two chapters here.